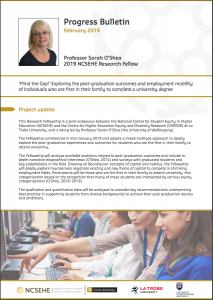 This 2019 Research Fellowship is a joint endeavour between the NCSEHE and the Centre for Higher Education Equity and Diversity Research (CHEEDR) at La Trobe University, and is being led by Professor Sarah O’Shea (the University of Wollongong). The Fellowship commenced in mid-January 2019 and adopts a mixed methods approach to deeply explore the post-graduation experiences and outcomes for students who are the first in their family to attend university. The Fellowship will analyse available statistics related to post-graduation outcomes and include in-depth narrative biographical interviews (O’Shea, 2014) and surveys with graduated students and key stakeholders in the field. Drawing on Bourdieuian concepts of capital and habitus, the Fellowship will deeply explore how learners negotiate existing and new forms of capital to compete in shrinking employment fields. Participants will be those who are the first in their family to attend university, this categorisation based on the recognition that many of these students are intersected by various equity categorisations (O’Shea, 2016–2019). The qualitative and quantitative data will be analysed to consider key recommendations underpinning best practise in supporting students from diverse backgrounds to achieve their post-graduation desires and ambitions. For further details or updates about the Fellowship, please contact first-in-family@uow.edu.au or follow @Uni_FiF.